Jackson didn’t read the room as Griffin told his frustrations, and yikes… it was awkward. The Detroit Pistons beat the Anthony Davis-less New Orleans Pelicans, 98-94, on Wednesday night. Yay, right? Well, it’s a yes and no from Blake Griffin, and nobody told that to Reggie Jackson. 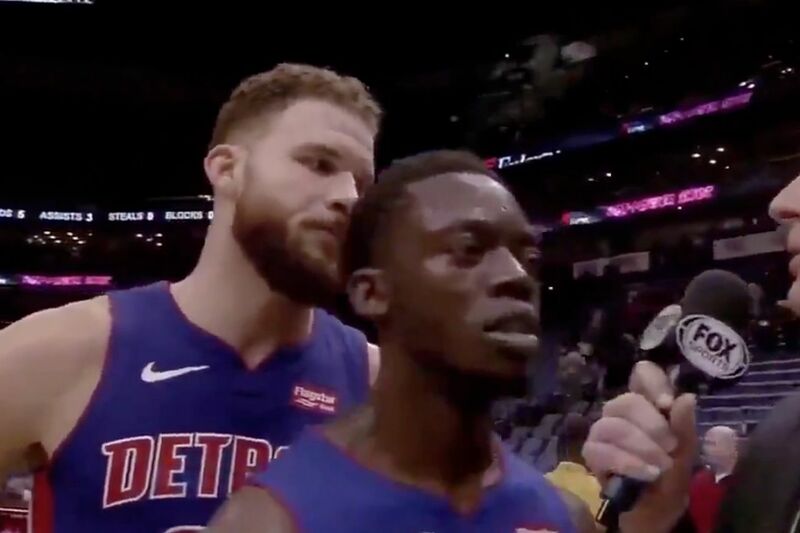 After Griffin went off for 37 points, nine rebounds and seven assists, he gave a postgame interview to voice his displeasure with the 21-26 Pistons, which “masked its issues” with the close win. And just as he’s finishing his speech about the team’s inability to close games, in comes Jackson, who could not have read the room worse. Reporter: Can you take a big exhale after this one? Griffin: I’m not sure. It’s nothing to be proud of man, it’s just masking our issue. We have to lock in and finish games. Our lack of focus at the end of games has been awful. That’s why we lose games like this. So I’m happy with the win, but I’m not necessarIly happy with how we’ve closed games out. This is what we call a… YIKES. Griffin gave one of those fake smiles and put a towel over his face. This wasn’t as bad as — but definitely reminded some of — the horribly uncomfortable Stan Van Gundy interview where he told the media that Dwight Howard wanted him fired and then Dwight WALKED RIGHT IN. Shoutout to Blake Griffin for keeping his composure as best as he could. Hopefully Reggie doesn’t watch the replay.